In January 2009, a US Airways Flight landed on the Hudson River in New York, with all 155 passengers and crew surviving with only minor injuries. 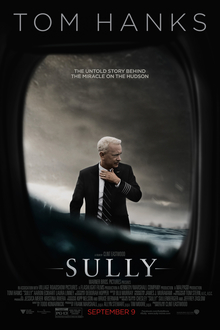 The film ‘Sully’ attempts to tell the story of this miraculous escape by focusing on the man at the heart of it, Pilot Chesley ‘Sully’ Sullenberger, with the film taking in the event itself and the subsequent investigation and media reaction. If you want to cast a man to emit a common decency there’s little better than Tom Hanks, and he delivers a typically strong performance at all times. Clint Eastwood directs the film in an unfussy manner, trusting in the story and the performances to do the work for him and this works well, and ‘Sully’ is a satisfying and thoroughly enjoyable retelling of a ripped from the headlines story. Hanks is supported by Aaron Eckhart (in his second excellent performance of the weekend after ‘Bleed for This’), alongside a generally solid group of supporting character actors to bounce off. This is Hanks film though and he features in just about every scene, showcasing the character’s calm demeanour and railing against the faulty investigation in a composed and decent manner befitting of all that we know about the character. Looking into the film’s themes at a deeper level, it feels like Eastwood is railing against the blame culture to an extent in the way he depicts the investigators, arguing against an environment and a culture where accidents aren’t possible and that a fault needs to lie somewhere. I also particularly liked how the film shows the ordinary heroism, not just of ‘Sully’, but of the various emergency crews, tourist boats and passers by who stop everything to come together to help each other out. I felt this was shown quite subtly with limited comment and I felt it was particularly powerful, particularly when contrasted with the blame culture propagated by the investigators representing the airlines. ‘Sully’ isn’t a perfect piece of filmmaking and at times it feels like a short story has been stretched to capacity, with some of the conflict depicted in the investigation feeling a little contrived to give the story more of an ‘antagonistic’ feeling, but the good parts more than outweigh the bad. The film has a choppy approach to its timeline, bringing in dream (or nightmare) sequences and a non linear approach to depict the event itself and the investigation it followed. One of the strongest testaments I can give to the film is that it felt tense and exciting, despite the end point being clear and revealed from the outset. The flight sequence itself is thrilling (albeit not quite as technically marvellous as the scene in ‘Flight’) and despite going into the film thinking the content may give me the jitters the next time I fly, it reassured me if anything that these people really know what they’re doing and can be trusted with our life in their hands for the duration of a flight. ‘Sully’ is a really entertaining movie, led by a typically solid Tom Hanks performance, and it’s a fantastic tribute to the human spirit and how we come together to support each other in times of crisis.